Miramar Concrete Vent Blocks from Atlantic Coast Precast will not disappoint you. We will make you our top priority when you hire us. Since starting our business in 1965 we have earned a stellar reputation in the industry. Our concrete vent blocks are very popular with contractors, architects, engineers, designers, and other industry professionals. You can choose your concrete vent blocks in various shapes, sizes, and designs. By using our vent blocks you will be allowing the air underneath your home or business to flow naturally. Our concrete vent blocks can make any space more beautiful and are also an excellent way of preventing excessive moisture underneath your foundation. Get your Miramar Concrete Vent Blocks from Atlantic Coast Precast and you will not regret it. Our concrete vent blocks are made of two pieces which allow cross-ventilation. 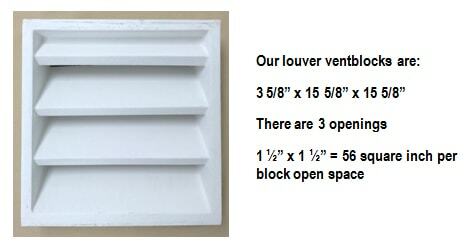 This block and screen vent block can be used in foundations, garages, and range hoods. By maintaining proper ventilation underneath your foundation you will be keeping excessive moisture at bay. Since our vent blocks are reinforced with a galvanized frame they last a longer time and are much stronger. You will be very impressed with the quality of our vent blocks. Miramar our Concrete Vent Blocks will not disappoint you. They offer protection against damp rot and termite infestation. Avoid major moisture damage with our vent blocks. Our state-of-the art molds help to prevent excessive moisture, and allow us to deliver superior quality at an affordable rates. Contact us today to discuss your specific needs. You will be very impressed with our flawless workmanship, long-lasting products, and speedy service. We look forward to speaking to you!